For the past 30 years, The University of Texas at El Paso has experienced unprecedented growth in facilities, academic programs and enrollment. This growth is the direct result of our success in articulating a clear and bold vision and mission, and in pursuing our goals through highly intentional and agile strategies. Our foremost goal was to create authentic educational opportunities of the highest quality for all talented young people in the Paso del Norte region, including far West Texas, southern New Mexico and northern Mexico, for whom UTEP represents a pathway — perhaps the only pathway — to a better future for them and their families. To do that, we knew that we had to build a large, externally funded research portfolio and increase the number of doctoral programs we offered. We’ve delivered: Annual research expenditures have grown to $95 million from $6 million, and we now have 22 doctoral programs where we had one. We have also recently reached an extraordinary milestone; UTEP was awarded a coveted R1 designation (top-tier doctoral university with very high research activity) in the Carnegie Classification of Institutions of Higher Education, making it one of only 130 universities among the 2,883 four-year higher education institutions across the U.S. to earn this prestigious distinction. 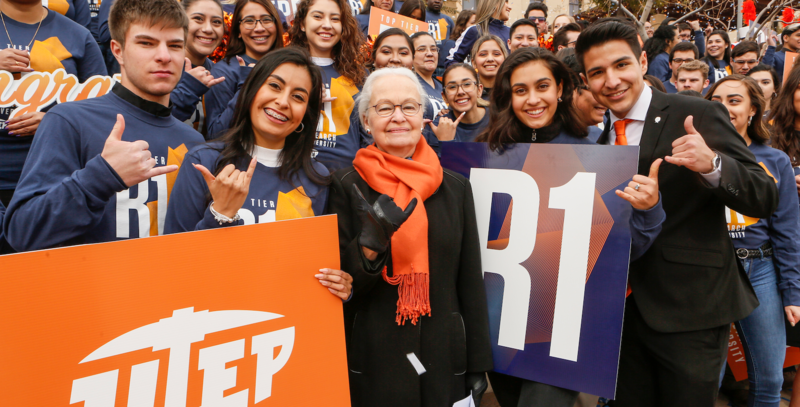 What makes UTEP’s rise to this R1 level unique is our abiding campus commitment to access, which places a high priority on ensuring that research excellence always be accompanied by a deep and sustained commitment to access. UTEP’s R1 status is only the latest recognition of our dedication to both access and excellence. In 2017, the Brookings Institution recognized UTEP with a No. 1 ranking among all U.S. research universities for its success in achieving both competitive research and fostering social mobility. UTEP’s student body of more than 25,000 reflects the demographics of the U.S.-Mexico border region from which nearly 90 percent of them come. Today, 80 percent of UTEP’s students are Hispanic, more than 50 percent of them are the first in their families to attend college, and 40 percent report annual family incomes of $20,000 or less. Notably, UTEP maintains one of the lowest out-of-pocket costs of any doctoral research university in the country. UTEP’s impact has resonated well beyond the campus. Across Texas, NASA and such industry partners as Lockheed Martin, Texas Instruments and ExxonMobil benefit from the many UTEP graduates who walk their halls as full-time employees and interns, and who apply their talents and skills to advance their business and research objectives. UTEP faculty members participate in regional and national inter-university and industry collaborations to desalinate groundwater, enhance medical treatment, advance the competitiveness of U.S. manufacturing, attack environmental contamination and create new technologies. Globally, UTEP has established productive relationships with tech giants Microsoft and Google, such additive manufacturing leaders as America Makes and Aconity3D and other partners attracted by both the innovative research underway on our campus and the highly prepared UTEP graduates whom they are eager to recruit. In addition, faculty members and student researchers participate in local collaborations with the city and county of El Paso, and many federal partners including the Department of Defense, the National Oceanic and Atmospheric Administration and the Food and Drug Administration. These affiliations have resulted in further advancement of research on campus and the establishment of new career opportunities for our students. UTEP’s emergence as a top-tier research university illustrates the numerous ways in which access to discovery and innovation can expand boundaries, heighten knowledge and enhance economic growth. The research and scholarship on our campus has become a bedrock for new products, services, businesses and jobs. In fact, UTEP ranks third among all public universities in Texas in federal research spending per tenured and tenure-track faculty member, after UT Austin and Texas A&M. For much of our history, UTEP and our outstanding alumni have positively impacted the rest of Texas and beyond. With our new R1 designation, we are energized to pursue additional new and exciting opportunities to enhance the prosperity and quality of life not only for our students but also for Texans across the state. The University of Texas at El Paso is a top tier doctoral research university located in one of the largest binational communities in the world. The University enrolls more than 25,000 students, invests $95 million in research annually, and offers 170 bachelor’s, master’s and doctoral degree programs in eight colleges and schools. It maintains one of the lowest out-of-pocket costs of any research university in the U.S., underscoring its commitment to make education accessible to all.